Everyone’s into craft beer. Even Ben and Jerry’s ice cream! I was dreaming of ice cream and beer (yes, I did) and lo, and behold, Ben and Jerry’s is making a brown ale-flavored ice cream with salted caramel and fudge brownies. 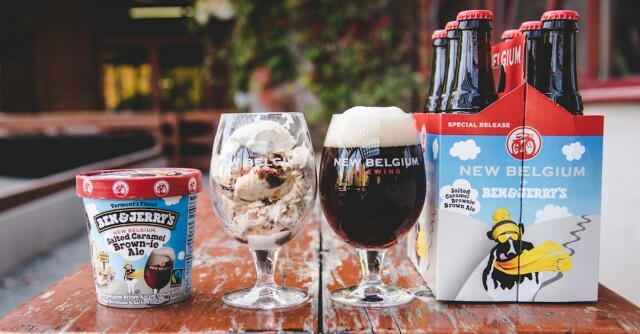 They’re collaborating with New Belgium craft brewery who is also making a salted caramel brownie brown ale to go along with the ice cream. Sounds like a lot of caramel. Fun for a one-off, I guess, but I’ll take my craft beer straight thank you. The good part is that a portion of the proceeds will be going to Protect Our Winters, an organization started in 2007 by awesome snowboarder and humanitarian, Jeremy Jones, to combat climate change. So, eat and drink away…it’s for a good cause.